One of the best ways you can support TouchArcade is by doing your Amazon shopping through a TouchArcade affiliate link. We’ve set up the easy to remember toucharcade.com/amazon too if you want to type that in or bookmark it. We get a small percentage of anything you buy through any of these links, which otherwise would just go to financing Jeff Bezos’s space program or whatever else he’s up to now, and it goes a long way to supporting the site at no additional cost to you. These Amazon Items of the Day articles are all products we have used ourselves, and feel are things that the TouchArcade audience might be interested in! Our inaugural Amazon Item of the Day is the Nebula Capsule Smart Mini Projector by Anker, which is by far the coolest gizmo I’ve added to my arsenal lately. I’ve been captivated by the pico projector market for years now, as my cousin owned a (very expensive and very crappy) first generation unit years ago. It was real neat on paper, but the early pico projectors weren’t very bright, didn’t have onboard speakers, required a video source, and basically were really not conducive to bringing anywhere because you had to bring so much extra junk to actually use it. The Nebula Capsule, on the other hand, is completely self-contained and is the same size as a soda can. It’s one of those things you really can’t believe how small it actually is until you see it in person, as none of the photos really do it justice. When I say “self-contained," I mean self contained. It has onboard speakers, an onboard battery good for four hours of play time, and runs Android. This means if you’ve got any sort of nearby WiFi connectivity, you just connect to a network and you don’t need to do anything other than turn the thing on and start streaming Netflix. Additionally, if there’s no WiFi nearby, there’s micro SD card slot that you can load up with media and play locally. It even works as an AirPlay receiver, so you can mirror your iOS device’s screen or shoot other video to it via AirPlay. Whenever I pull this thing out of my bag at any kind of get together, the reaction is always along the lines of, “Holy crap." I just have it tethered to my iPhone, and thanks to a Verizon “unlimited" data plan, I just stream whatever I feel like. As long as I have any kind of surface to project on and enough cellular signal to stream, we’re rocking and rolling. I’ve used this sitting at hotel pools before and I felt like an Anker salesman, as it was almost annoying the amount of questions we were getting from other people. Now, the down-sides: As a pico projector, you’re always going to be limited by brightness. The Nebula Capsule is 100 ANSI lumens which basically means you need to either use it indoors, or at night without a ton of ambient light nearby. At night with ambient light (like my pool example) is totally workable, the picture just gets a bit washed out. That being said, it’s hard to imagine using a device like this to have some serious cinephile movie night where you’re expecting top-tier audio/visual quality, so as long as those are your expectations going in you’re really going to like this projector. The other knock I’ve got is the remote is … sort of junky. It feels really light and plastic-y, and I managed to break the battery door the first time I used it by pulling the plastic tab that was insulating the battery from making contact on the first use. I’ve got it “fixed" with some tape, but it looks crappy. Thankfully, the only time you ever really need to use the remote is when you’re first pairing your phone as the Capsule Control app (Free) is far, far more functional and what I end up using anyway. 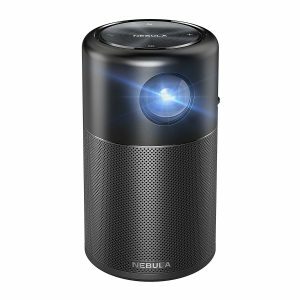 At $256.99 (as of this writing) the Nebula Capsule is on the lower end of what you’d pay for an actual projector and about in the middle of the road for what other pico projectors cost. I’ve had nothing but good luck with Anker products over the years, which makes this one another easy recommendation. Thanks for checking out today’s Amazon Item of the Day, and as mentioned before, even if you’re not interested in this particular product, buying things from Amazon by first visiting toucharcade.com/amazon is immensely helpful in supporting the site at no additional cost to you. If you want to take things a step further, you can check out our Patreon, but either way we just appreciate you sticking with us and continuing to both visit and contribute to the TouchArcade community over the years! If you’ve got a product you’re interested in seeing featured in an Amazon Item of the Day, don’t hesitate to reach out. The best way to get in contact with us is via email at tips@toucharcade.com and be sure to include “Amazon Item of the Day" in the subject.